As far as basic word processing, Writer has all the tools and capabilities of Word. Listing all the features would be pretty rediculous; let's just say everything you expect is here and then some. For instance, Writer has a bibliography database built. Makes sense. It also has a media player (movies and music), which does not make a much sense (ed.). Thankfully it does not try and take over your file associations. Like Word, Writer allows you to drag and drop items like pictures or text directly into the document. It also supports an extensive list of file formats - including a couple that Word does not (like DXF and PSD). The spellcheck feature in Writer works much like Word's. It supports both type-as-you-go checking and whole document checks. It also supports custom dictionaries. This seems to be an area of improvement for OpenOffice. In the past I have attempted to switch to Writer from Word. 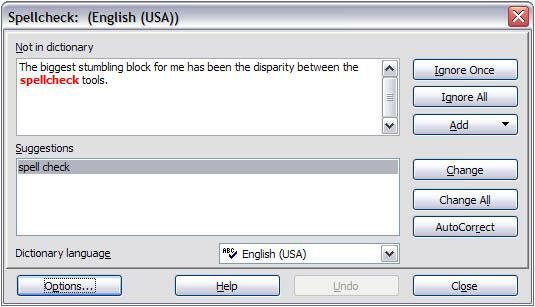 The biggest stumbling block for me has been the disparity between the spellcheck tools. As someone who spells very poorly (you can probably tell, I usually miss about 10 typos per page) a quality spelling tool is critical. Unlike Word, Writer does not have a tool for checking grammar. For people with a good command of their respective language this might be a non-issue, but for people that write like me it can come in handy. See Grammar Check. Write still lacks this feature, which is a downer. The latest version of Writer improves the word count feature (hey, some people like to know) by allowing you to count within a selection as well as the whole document. 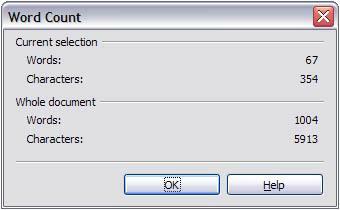 While you can add a button to the toolbar, it doesn't display the word count in the bar as the tool in Word does. Maybe its unfair, but I don't like unnecessary pop-up boxes.